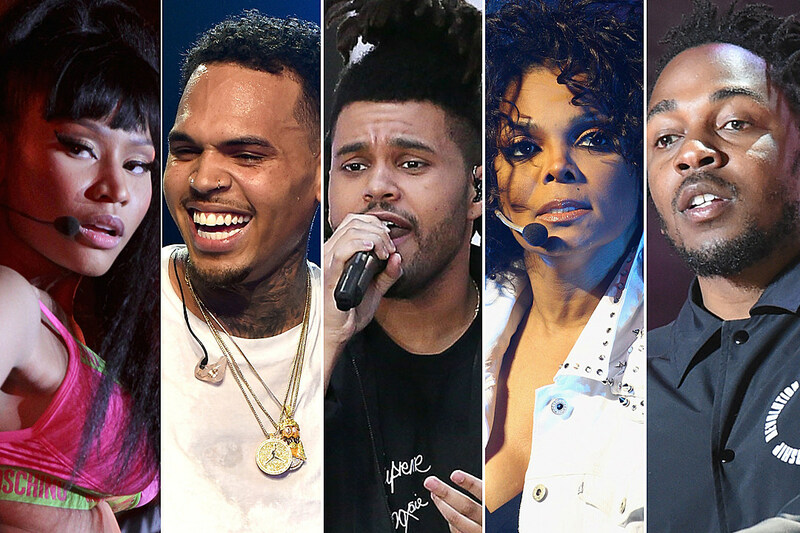 The 2015 BET Awards are just hours away. So this means you should be ready to drop everything you’re doing to catch the red carpet hits and misses, some showstopping performances and memorable (even tear-inducing) acceptance speeches. Considering the awards show is celebrating its 15-yearanniversary, there will be a lot more surprises for you to see. The 14 awards categoriesinclude rappers and singers with career-winning resumes. Best Male R&B/Pop Artist finds August Alsina, Chris Brown, John Legend, the Weeknd, Trey Songz and Usher competing for the win while Best Female R&B/Pop Artist nominees are Beyonce, Ciara, Janelle Monae, Jhene Aiko, K. Michelle and Rihanna. Then there’s the Best New Artist category, which features. Bobby Shmurda, DeJ Loaf, Fetty Wap, Rae Sremmurd, Sam Smith and Tinashe. With six nominations each, Chris Brown and Nicki Minaj are the artists who will most likely walk away with more than one award tonight. They’re both scheduled to perform as well, though each one hasn’t revealed which songs they’ll showcase. Breezy’s “Loyal” and “New Flame” are up for two nods each and in the same categories — Best Collaboration and Video of the Year. This will mark the Weeknd’s first-ever appearance on the awards show. With “Earned It” being a big hit for the Canadian singer as well as “Can’t Feel My Face” quickly becoming a playlist regular on radio, it’ll be interesting to see how he manages to mash up the two very different tracks onstage. Perhaps Abel, who is nominated for three awards including Best Male R&B/Pop Artist, will go with the latter song since it’s his newest release. As for Alicia, this will be her first performance since giving birth to her son, Genesis Ali Dean. Will she join Smokey Robinson for a tribute since he’s receiving the Lifetime Achievement honor? Stay tuned to find out. Another performance to look out for is Meek Mill. The rapper announced that his long-awaited sophomore album, Dreams Worth More Than Money, will arrive on June 29 so he has much to celebrate once he hits that stage. He just released “All Eyes on You,” his new song with boo Nicki and Breezy, which will more than likely be the record he chooses to perform on Sunday evening. The awards show isn’t only the place where artists are recognized for their stellar talents or a place to showcase their personal style. It’s also where feuds are ended. The infamous beef between Tamar Braxton and K. Michelle, which played on Twitter more than a few times over the last year, definitely made headlines. However, the singers have since ended their bickering and will perform together tonight. Reconciliation is to be applauded but there is one moment that may be even bigger than a feud that comes to an end. Janet Jackson will receive the inaugural Ultimate ICON: Music Dance Visual Award, which honors the singer for her lauded dancing in the music videos she’s released over the years (who can ever forget those moves in “Rhythm Nation”?). She will also be honored with a dance tribute led by Ciara, Tinashe and Jason Derulo. Even though the awards show is focused on music, this dance number will certainly be one of the highlights of the night. Clearly there’s so much going on at the 2015 BET Awards this evening that if you don’t watch, you’ll be missing out on the hot topics of conversation tomorrow morning. With Black-ish stars Anthony Anderson and Tracee Ellis Ross serving as the hosts of the ceremony, you’ll enjoy lots of laughs between performances. So be sure to tune in to the BET Awards to see all the magic unfold at the Microsoft Theater in Los Angeles at 8PM ET.